March is a great month for shark diving, both in the northern and southern hemisphere. The Ningaloo Reef UNESCO World Heritage Site, in Western Australia, has 300 to 500 whale sharks visiting each year. March marks the beginning of the arrival of hundreds of these whale sharks and divers can enjoy water temperatures of 30 degrees Celsius (87 degrees Fahrenheit) whilst getting to know these gentle giants. Manta rays, potato cod and other shark species are resident in the area. Another advantage of visiting in March is to witness the coral spawning at the reef, which usually occurs a week after the March full moon. Malapascua is another March diving highlight. This peaceful, friendly area of the Philippines has a variety of dives to enjoy including reef, cavern and wall dives. The real highlight though is Malapascua’s thresher sharks. 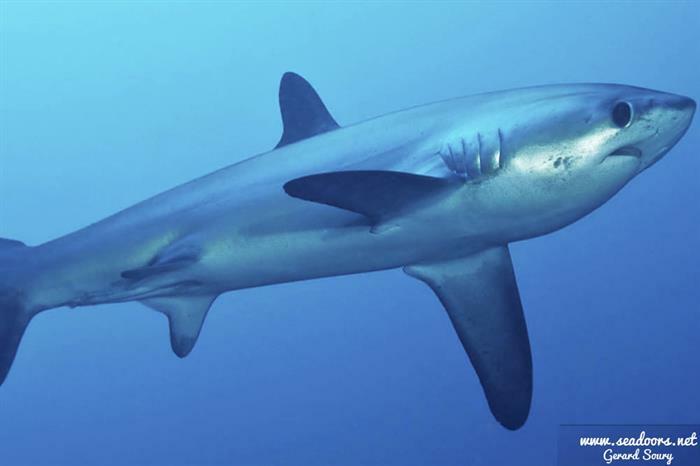 This deep-water and elusive shark species has put Malapascua firmly on the shark diving map, with Monad Shoal being the only location in the world where thresher sharks are reliably seen. The Seadoors liveaboard offers thresher shark diving at Malapascua and other fantastic Philippines dive areas. March is a good month to visit to take advantage of calm seas and sunny weather. It is the dry season in Cuba during March, which provides great diving conditions to enjoy the Jardines de la Reina, or Gardens of the Queen national park. This park protects Cuba’s southern coastline and is one of the most successful conservation areas in the Caribbean. This chain of 250 coral and mangrove islands contains abundant marine life, including the rare and iconic elkhorn coral. Sharks are one of the main attractions of the area including lemon, silky, blacktip, nurse and great hammerhead sharks. This marine reserve only allows a limited number of visitors each year, which helps to maintain its pristine condition. More information about these March diving highlights and other great destinations to visit are in Best Places to Dive in March.